Field selectable: Pulse or square wave 0 to 5V, 0 to 12V, or 0 to 24V @ 30 kHz; TTL; open collector 4.7 kΩ pull-up to 5V @ 30 kHz; NPN or PNP transistor, switch contract 4.7 kΩ pull-up to 5V @ 40 Hz. ±0.03% of calibrated span ±1 count. 85 to 265 VAC 50/60 Hz, 90 to 265 VDC, 20 W max or 12 to 24 VDC ± 10%, 15 W max. 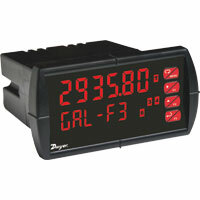 Dual-line 6-digit display, 0.60" and 0.46". Operating: -40 to 149°F (-40 to 65°C); Storage: -40 to 185°F (-40 to 85°C). Removable screw terminal blocks accept 12 to 22 AWG wire, RJ45 for external relays, digital I/O, and serial communication adapters. 2 or 4 SPDT (Form C) internal and/or 4 SPST (Form A) external; rated 3A @ 30 VDC and 125/250 VAC resistive load; 1/14 HP @ 125/250 VAC for inductive loads. 85 to 265 VAC models: 200 mA @ 24 VDC; 12 to 24 VDC models: 100 mA @ 24 VDC; Second supply with output 2 models: 40 mA @ 24 VDC. 0 to 999.9 seconds, on & off relay time delays programmable and independent for each relay.